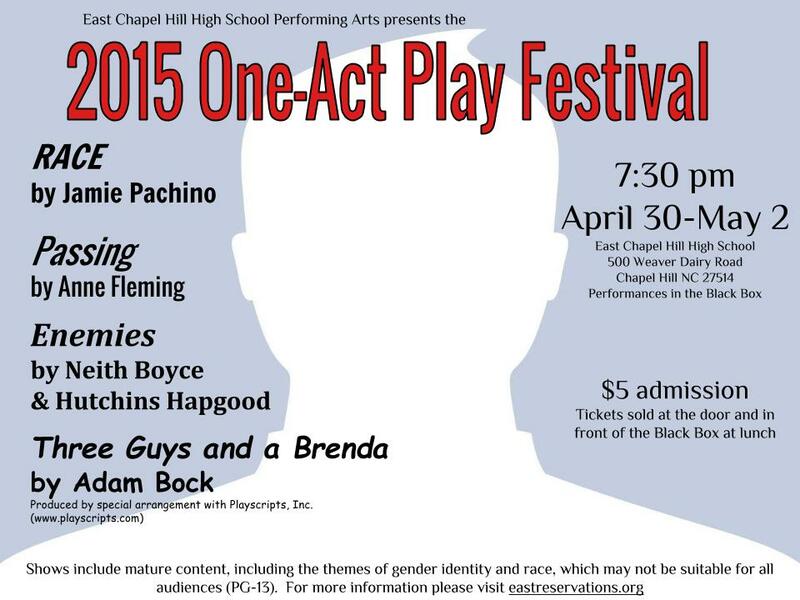 The East Chapel Hill High School One-Act Play Festival features four student-directed short plays that range from comedic and jovial to dramatic and thought-provoking. Note from the director: “Race” is a piece of verbatim theater, meaning that every word said by an actor was previously said in interviews by real, everyday people. Over 20 years ago, Studs Terkell asked Americans how they felt about the predominant at the time racial issue in the country and recorded their answers. This one-act is a cropped version of the stories and opinions of those Americans, all of which are still very much prevalent in today’s society. As 2014 comes to a close and another year begins, it is imperative that we do not repeat the injustice and hostility and ignorance that dominated our country for a time. The only way to cure this ignorance and to keep it from following us into the next year and the year after that is to have a discussion that presents the point of view of every different human living in this community. The word “race” provokes many different emotions and holds many different connotations for different people. It is important that we hear all of these perspectives so that we can begin to understand each other better. Only then can we begin to see progress. Note from the director: “Passing” is a contemporary drama which confronts the topics of gender identity and sexual orientation. It tells the story of a transgender teen with references to the death of American transgender teen, Brandon Teena, raped and assassinated in 1993. The play also hints at controversial issues in today’s world such as mental health, gender equality, and LGBTQ+ rights. Labeled PG-13, the play is not recommended for a younger audience but is not restricted. Over the course of four years, we seek to educate and prepare students to participate in professional and recreational theatrical experiences for a lifetime beyond the high school environment. With that in mind, we seek to expose audiences, performers, and technicians to as wide a variety of genres, artistic processes and themes as possible while producing shows we feel present age and talent appropriate challenges, foster intellectual and emotional growth, and spark relevant discussions within the school community. We seek to produce, cast and advertise shows in ways that are both participation and curriculum inclusive.